Made with white leather & colored leathers along with hand-painted details, These are our most magical creations yet. Tiny Heir moccasins are easy to put on, easy to take off, but most important they will stay on your child's feet. Our moccasins have an elastic around the ankle (at opening) to keep moccasin secure. The easiest way to determine which size to buy is to just measure your Tiny Heir's feet in inches from the heel to the top of the big toe and compare it with the size chart. 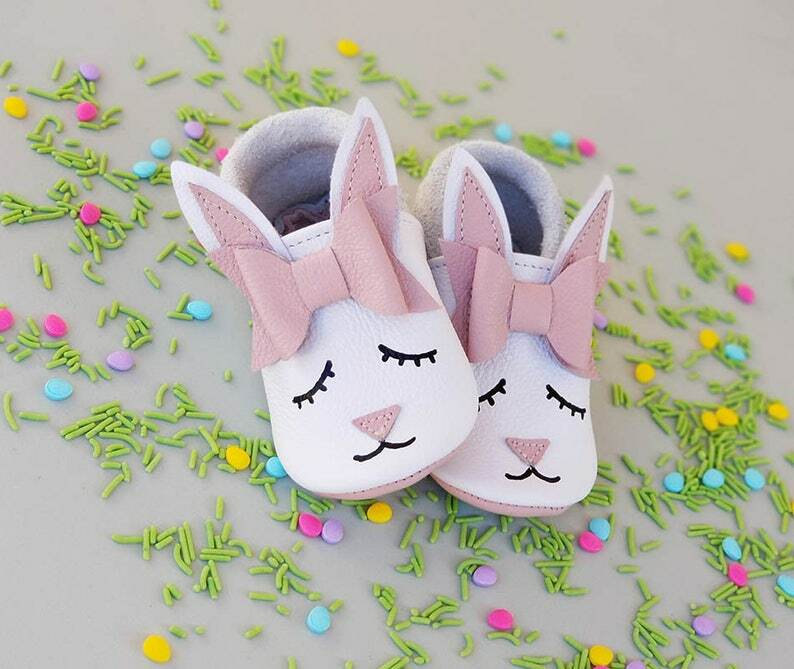 Baby Pink Unicorn Moccasin | Baby Moccasins | Baby Moccs | Handmade Baby Moccasins | Unicorn Moccs | Unicorn Shoes. Gold Dot Unicorn Moccasin | Baby Moccasins | Baby Moccs | Handmade Baby Moccasins | Unicorn Moccs | Unicorn Shoes. Baby Fox Moccs In Gray | Baby Moccasins | Handmade moccs | Fox Moccasins | Crib Moccs | Leather Shoes| Crib Booties | Fox | Baby Shower . Being the difficult human I am, I also asked to change the color on these bunny moccasins. Not only did they still come with the same INCREDIBLY fast turnaround, they might be the cutest things I’ve ever seen. Bunnies have a special meaning to our daughter, and these did not disappoint. They are so well made and beautiful. I plan to continue with my streak of being a pain and ordering them in multiple other colors. We will be customers for a long time. Platinum Unicorn Moccasin, Baby Moccasins , Unicorn gift, Unicorn Birthday, Unicorn Party, Handmade moccs. Flower crown Unicorn Moccasins, Baby Moccasins, Baby Girl Shoes, Unicorn Baby Shoes, Princess Shoes, Blush Unicorn, Unicorn Birthday Party.